Off-site airport parking is usually offered by companies within a 2 mile radius of the airport. By traveling a little extra, you will get a big discount! A variety of off-site parking options service Detroit Metro Airport. These days, you have the ability to reserve your DTW airport parking in advance so that your spot is ensured. At Airlines Parking, you are given the choice between self or valet park options. All parking spaces are in our safe and secure parking lot to ensure that no harm comes to your car while you are traveling out of Detroit. Say goodbye to long waits and hefty taxi fees and hello to complementary shuttles that take you directly from your parking spot to your DTW airport terminal for free! Unlike the airport, Airlines Parking offers a corporate discount rate. This way, employees can have a comfortable business travel experience that is easy on company wallets. Insider Tip: Complementary charging stations are coming soon! If you have a hybrid electric car, you won't have to worry about it having a low charge upon your return. 1. Calculate the costs. Believe it or not, there are charges for flying with your pet. These costs can range from $75-$200 for a one-way flight. Research airline rates ahead of time so you aren't stunned by these fees when it’s too late. 2. Visit the vet. Call your airline and find out if they require vaccination and health documentation for your pet. Find out if your pet has any health concerns that will make flying more difficult. Even better: research local vets at your destination so you’re prepared in case something goes awry. 4. Prepare the carrier. Putting your pet in a strange kennel the day of your flight out of DTW and hoping it will be calm is a recipe for disaster. Instead, place the animal in the container a few times at home. Line the bottom with a familiar blanket and include a favorite toy to provide a sense of security. 5. Pile on the exercise. They day before and morning of your flight, exercise your pet as much as possible. The goal is to tire them out so they are relaxed on travel day. 6. Don’t forget food and water. 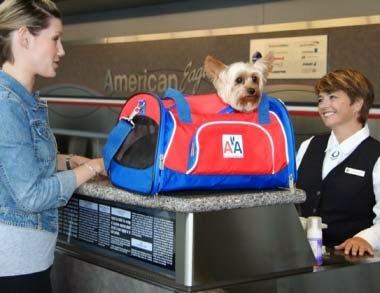 No matter how short you think the flight may be, always pack food and water in your furry companion’s crate. Freeze water before you leave home for easy transportation and a cool refreshing treat once the plane is in the air. 7. Ditch the Drugs. The American Veterinary Medical Association advises that owners never sedate their pets when flying. The combination of tranquilizers and high altitudes can prove fatal. Reduce some of your own travel anxiety about Detroit Airport Parking by making a free online reservation with Airlines Parking! Did you know that the Fourth of July is one of the busiest times of year to travel? 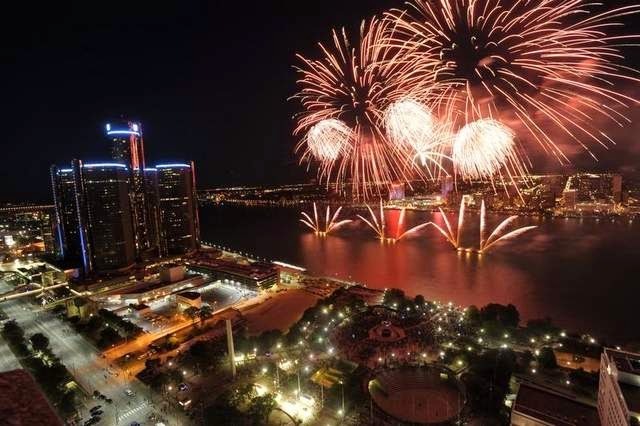 With this in mind, Detroit is the perfect place to celebrate Independence Day! Pay tribute to America’s birthday with Airlines Parking this year by enjoying fun fireworks, fantastic weather, and patriotic parties. v Wolverine Lake Tiki and Fireworks Display. Enjoy a spectacular fireworks display on the banks of Wolverine Lake. Fireworks begin at dusk and the beach will be festively lit by tiki torches. v Detroit Tigers at Comercia Park. What is more American than baseball, hot dogs, and fireworks? Celebrate 4th of July with the Detroit Tigers all weekend! v Battle Creek Field of Flight Air Show and Balloon Festival. The nation’s largest combined air show and balloon festival is happening this holiday weekend! Tickets range from a mere $5-$10 and you can enjoy fireworks at dusk. v Soaring Eagle Stars and Stripes Spectacular. With tickets starting at $20, you can enjoy monster truck madness, a concert featuring Switchfoot, and motocross! This event goes on through Sunday, July 6th. Make your Fourth of July travels in and out of Detroit Metro Airport less stressful when you park your car with Airlines Parking.